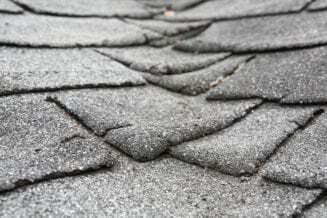 Asphalt shingles are made up of 3 main components: a mat of fiberglass or some other kind of polyester or organic mat, two layers of asphalt that sandwich the mat between them, and a top coat of ceramic mineral granules embedded into the asphalt. It is these granules that give the asphalt layer it’s protective armor shielding against impacts and UV rays, also adding fire resistant properties. Without the protection the granules provide, the asphalt would soak of UV rays and begin to crack and degrade in quality very quickly. Granule loss occurs when the embedded granules begin to loosen and fall off the shingle. You may find evidence of this in your gutters or sometimes in your yard. However, not all granule loss is a concern. Let’s look at a few causes so that you can determine if you need a roof inspection from a professional. There are many different reasons you could be experiencing granule loss, some can be prevented while others can only be monitored. As your roof ages and endures a series of weather events, it will naturally begin to lose granules. The bond holding the embedded granules gradually begin to degrade and releases the granules. This makes the shingle more acceptable to UV damage which leads to brittleness, cracking. If your roof is more than 10 years old, you could be in need of a roof replacement. Granule loss is often evident after a large or heavy storm, especially after a large hail event. If you see signs of this, you should call for a professional inspection as there could be potential damage to cause costly leaks in the future. If your roof is new, there is a good chance that there will be a great number of granules in your gutters or on your yard in the weeks or sometimes months to come. Every shingle has residual granules that are stuck to the shingle but not embedded. This is by design so that during installation these granules will take much of the abuse while the embedded granules stay preserved for the long haul. Your Roof has a Physical Hazard Causing Damage. Excessive granule loss in specific places can almost always be traced back to a variety of physical hazards. Animal damage, tree limbs brushing the roof, or constant heavy traffic to adjust the satellite dish all can lead to granule loss in only those specific areas. While not common this does still occur. If there is a defect in the shingle, the most common symptom will be blistering. Blistering occurs when pockets of moisture form inside the asphalt layer and as the moisture expands and contracts if forms the blisters. Often if shingles are overlapped or not properly aligned next to one another there could be a significant loss. Additionally, improperly installed shingles will lead to leaks and other costly damages in the future. Can You Prevent Granule Loss? While it is not possible to prevent granule loss altogether, you may be able to slow the progress. To have your roof inspected by a professional, reach out to Baker Roofing & Construction. We’re your local, honest roofing contractors for all your roofing and construction needs. Baker Roofing & Construction Inc.